(Nanowerk News) A new type of quantum bit called a "phase-slip qubit", devised by researchers at the RIKEN Advanced Science Institute and their collaborators, has enabled the world's first-ever experimental demonstration of coherent quantum phase slip (CQPS). The groundbreaking result sheds light on an elusive phenomenon whose existence, a natural outcome of the hundred-year-old theory of superconductivity, has long been speculated, but never actually observed. 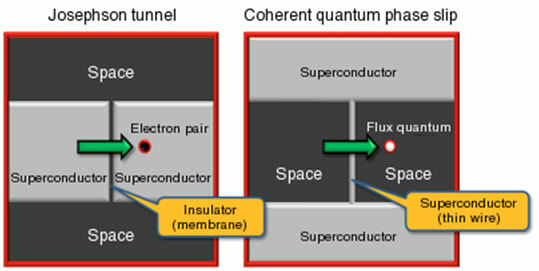 Figure 1: Josephson tunnel (left) and coherent quantum phase slip (right). (Left) Two superconductors separated by thin insulator (in this case space). Current is produced by superconducting electron pairs tunneling across the insulator. (Right) Two insulators separated by superconductor. Current is produced by magnetic flux tunneling across the superconductor. Superconductivity describes a phenomenon in which electrons pass through certain types of materials without any resistance when cooled below a given temperature. Among the most important applications of superconductivity is the Josephson junction, named after physicist Brian Josephson, who in 1962 predicted that a superconducting current could tunnel between superconductors separated by a thin insulating layer. This phenomenon, the Josephson effect, has been applied in a variety of areas including magnetometer design, voltage standardization, and quantum computing. Researchers have long known of an intriguing theoretical parallel to the Josephson effect in which insulator and superconductor are reversed: rather than electric charges jumping from one superconducting layer to another across an insulating layer, magnetic flux quanta jump from one insulator to another across a superconducting layer (Figure 1). Quantum tunneling of electrons in the Josephson junction is replaced in this parallel by the coherent "slip" of the phase, a quantum variable that, in superconducting circuits, plays a dual role to that of electric charge. Figure 2: Energy band gap obtained using energy spectroscopy. Existence of band gap establishes that coherent tunneling has occurred. Coherent quantum phase slip (CQPS), as this phenomenon is known, has long been limited to theory-but no more. In a paper in Nature ("Coherent quantum phase slip"), Oleg Astafiev and colleagues at the RIKEN Advanced Science Institute (ASI) and NEC Smart Energy Research Laboratories report on the first direct observation of CQPS in a narrow superconducting wire of indium-oxide (InOx). The wire is inserted into a larger superconducting loop to form a new device called a phase-slip qubit, with the superconducting layer (the thin wire) sandwiched between insulating layers of empty space. 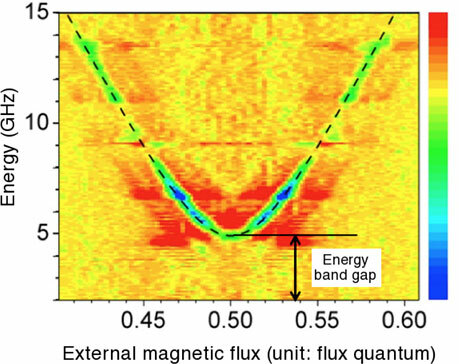 By tuning the magnetic flux penetrating this loop while scanning microwave frequencies, the researchers detected a band gap in the energy curves for the two flux states of the system (Figure 2), just as theory predicts. This gap is a result of quantum mechanics, which prevents the two states from occupying the same energy level, forcing them to tunnel across the superconducting layer-and through a quantum phase-slip in the narrow wire-to avoid it. While demonstrating conclusively the existence of CQPS, the successful experiment also ushers in a novel class of devices that exploit the unique functionality of quantum phase-slip to forge a new path in superconducting electronics.